Have a holly-jolly drinky time at this Saturday's annual SantaCON bar crawl-slash-citywide disturbance. So let's say you just got laid off, as remote a possibility as that is. You probably don't have anything going on Saturday (you barely know which day it is, they all blend together anyway) other than sending out résumés, filing for your weekly check, and weeping quietly in the other room. We say skip all that (except for the check-filing part). Why not spend some of your severance on a red suit and join the annual SantaCON with two thousand people just like you? Warning: There will be drinking. Starting at 10AM. Hope that doesn't offend your sensibilities. You've seen SantaCON before: It's that group of merry Santa-suit wearing types who swarm cities across the nation one day a year (the New York event does indeed attract about 2,000 Santas), getting increasingly jolly as the day wears on. That's because SantaCON is basically a costumed bar crawl, described by the organizers as "not-for-profit, non-political, non-religious and non-logical Santa Claus convention, organized and attended for absolutely no reason." Sound insane? It is. This is why you live in New York, kids. Be jolly. Belly-laugh. Let people sit on your lap. Give out gifts. Santa looks like Santa. HOLIDAY APPAREL IS MANDATORY. A Santa hat is not enough. Get a Santa suit. Buy a Santa suit. Make a Santa suit. Steal a Santa suit. Get creative: be a Secret Santa, a Santasaurus, Candy-cane, a Reindeer, a Chanukah Chicken, a goddamn latke, Stewardess Santa, Knight Rider Santa, Crusty Peace Punk Santa, the occasional Legless Reindeer, Chanukah Squirrel, Emo-Elf, or the Santichrist. Just don't wear your f*****g jeans. 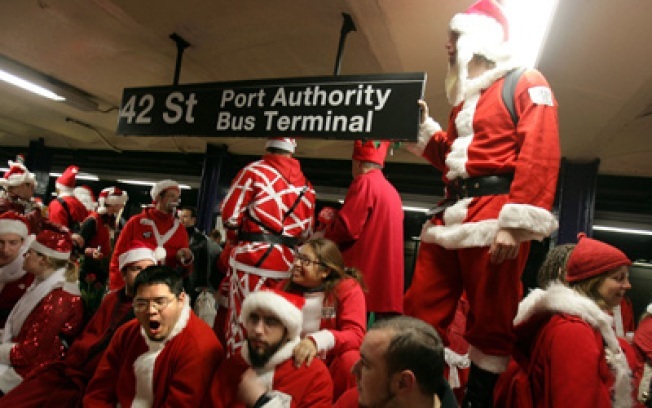 The crawl's meet-up spot/starting point will be posted at www.nycsantacon.com at 10PM.